Let’s all go to multi-cloud! In my last blog Are enterprises flocking the public cloud I made a case for multi-cloud. But is multi-cloud for everyone? 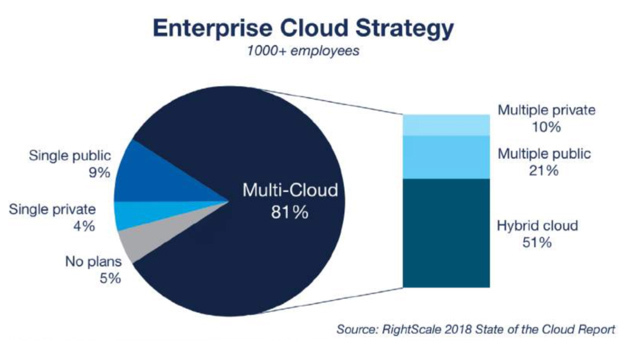 As per RightScale’s State of Cloud report 2018, many enterprises are using or planning to use more than two public clouds and three private clouds. These companies have either deployed or are in the process of deploying the IT architecture that enables greater efficiency and mobility, thus allowing them to exploit the best of breed capabilities offered by private and public clouds and avoid vendor lock-in. These enterprises are using public clouds for the purpose for deploying applications like analytics, ML/AI, data catalogs, and SaaS as well as application services like test/dev, training, and DR. 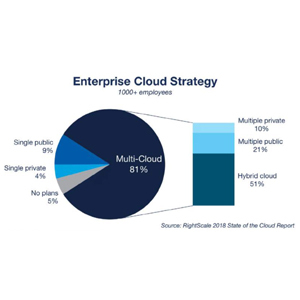 In the same report, 81% of the enterprises surveyed say they have a multi-cloud strategy. Enterprises are attempting to find an optimal IT architecture for application requirements and cost. Public cloud vendors like Google, who originally lagged the private cloud vendors, are beginning to compete for customer mindshare. The overarching goal for any enterprise IT is to achieve increased agility, greater flexibility, better automation, and differentiated capabilities. Utilizing multi-cloud is an important step to achieving this goal. Taking this step, however, is far from simple, and each enterprise must navigate its own unique path. Achieving success requires a thorough analysis of internal IT capabilities, application requirements, and potential solutions in the market. It is clear from the survey that enterprises are busy analyzing and experimenting with their cloud strategies. Now let’s look at the reality in terms of adoption of multiple clouds by enterprises. Many of my recent conversations with companies, looking to adopt public clouds technologies, have provided great insight into this topic. Like any new technology, multi-cloud has some early adopters. One such adopter is a financial institution based in the Bay Area where the board mandated an ‘all in the cloud’ strategy. This company has used AWS, GCP, and Azure for some of its applications and application services. The decision to adopt multiple clouds was driven by the goal to use best of the breed cloud provider for each application’s requirements. While this solution appeared to work in the beginning, the design has become complex and unmanageable. Adoption of cloud technologies was intended to provide efficiency, agility, and flexibility but instead has added overhead to the IT design and processes. There are new and different resources to manage, and the architecture is static and not flexible enough. The company is not able to make progress toward cloud adoption unless the core issues can be addressed. While multiple problems must be solved, the core issues originate from the company’s decision to use their private cloud tools and processes for the multi-cloud architecture without enough forethought. Their multiple clouds are managed with different processes and involved too many manual procedures. For example, to run test/dev on AWS, the engineers must execute multiple scripts and wait for many hours before starting to test. Do we keep these silo models? Should we consider more standardized cloud strategies? 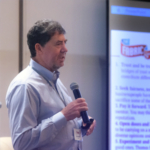 Are the IT teams capable of implementing a unified solution? Do I need a public cloud model for my IT? What are the benefits and plausible cost savings associated with this cloud model? Which public cloud is the best choice for our enterprise? Or which public cloud technology is best for each of our applications? Do my applications require the capabilities offered by different public clouds? Should I change my existing business applications to migrate to the public cloud? Which cloud vendor has better security, compliance, global reach, and tools for my particular situation? How do I ensure I am not locked into a particular cloud vendor? While containerization provides app portability, what about data portability? How does multi-cloud technology change my security policies and operation processes? What happens to data if it must be shared among applications deployed on different clouds? What about composite applications (a group of applications with mutual dependencies)? Can I move some of these applications to public clouds and keep some applications in my private cloud? Is multi-cloud for everyone? It can be. In order to realize the promise of efficiency, flexibility, and agility a multi-cloud model provides enterprises need to perform proper due-diligence and also have access to new innovative solutions that make the adoption of multi-cloud technology seamless. Many of these innovative solutions are today already available and can provide forward-looking answers for all the questions posted here. http://www.thefabricnet.com/wp-content/uploads/2018/06/enterprisecloudblog.jpg 300 300 Vinay Gaonkar - Head of Products & Marketing at KMesh http://www.thefabricnet.com/wp-content/uploads/2017/09/fabric-logo.png Vinay Gaonkar - Head of Products & Marketing at KMesh2018-06-28 11:43:012018-06-28 12:42:16Let's all go to multi-cloud!